PALEO JAY SMOOTHIE CAFE: No Heavy Lifting for Arnold! No Heavy Lifting for Arnold! When you talk about exercise in the usual paleo circles, ala crossfit etc., the mantra is to “lift heavy things!” The idea that you must lift heavy, meaning heavy weights on barbell back squats, deadlifts, and presses is a given. Well, I am here to say that it is not necessary, and never has been. It is not the weight lifted that is important, it is the muscular contraction intensity that counts! This can be achieved very well with isometrics, for example, without moving a muscle at all under weight, and so perfectly safely. For no matter what someone else tells you- lifting weights under heavy loads is extremely dangerous, and actually inevitably damaging to the joints, tendons and ligaments. For a testament from an expert, what does the now aged Arnold Schwarzenegger have to say about heavy back squats? “ I always have done each body part three times a week, with the idea being to train six days a week. But when you average it out it ends up being five days a week. You know, there are weeks when you’re sick, or weeks when you travel. Are there core exercises that you still do today? What about for shoulders? You’ve had rotator cuff surgery. Rotator cuff surgery?? This stuff is not paleo, folks! No One should be training in a manner that actually makes injury inevitable, even when doing the exercise perfectly. Now, Arnold has had a wonderful career, and can be excused for giving his early heavy weight lifting background part of the credit. And luckily, he woke up in time (10 years ago), as he underwent surgeries and his body cried out in pain. (I’m sure it still does. Ronnie Coleman, an 8 times Mr. Olympia winner is now in a wheelchair (he is 52 year of age). Arnold won the title 6 times before retiring. The point is that, either man could have built amazing physiques, cut and defined, with plenty of mass, perfectly safely and keeping their health intact, using Perfectly Paleo Exercise techniques. They might not have had quite the sheer bulk, but the bulk achieved with steroids and heavy weights has nothing to do with health, and actually has nothing to do with usable strength or aesthetics. Using virtual resistance, creating the resistance by the power of the flex in self-resisting an exercise, coupled with blood-infusing pushups and situps, coupled with things like pull-ups and bodyweight squats, is more than enough for a perfect build and usable strength- without damage to your precious body. So train naturally. Train for health, wellness, and a pleasing physique, not a bloated mass of bulk surrounding a bunch of injuries. 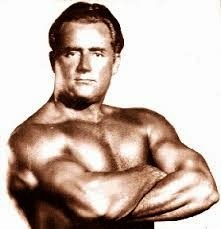 Charles Atlas: no weights physique! Perfectly Paleo Exercise Music by PaleoJay!